Just as it is essential that our sight not be crippled by scientific tunnel vision, so also it is essential that our critical faculties and capacity for skepticism not be blinded by the brilliant beauty of the spiritual realm. -- M. Scott Peck, The Road Less Traveled. it was a really neat experience in church today. all the youth (high school) had just gotten back from their yearly colorado retreat and they sort of led the church service and shared some of the experiences, and they were so jazzed and filled with the spirit of God. it was just a joyful time, and as i prayed my mind went to the peruvian children - yashira and all those sweet little ones who live in the rainforest and who touched my heart - and the machiguenga children who were unhealthy and sick, and i just sent out a wave of love toward them. and i thought of how all the places i've visited, the people i've met and the friends i've made they all have a place in my heart and always will. i cherish the people who have been my friends whether i presently keep in touch with them or not (and many i do). i thought of my dear friends in australia who i may be lucky enough to see again soon, and everywhere the people who have shown kindness to me. and my father, it is a day to bless and be thankful for fathers, and i had an amazing father who showered me with acceptance and taught me about reality without sheltering me from it. sending out love to all those kind souls who have been my friends over the years! and all those who i have met and who work for bettering the earth, for social justice, for wildlife, for environmental protection and for spreading the love of God and Jesus' radical message. keep on fighting the good fight! 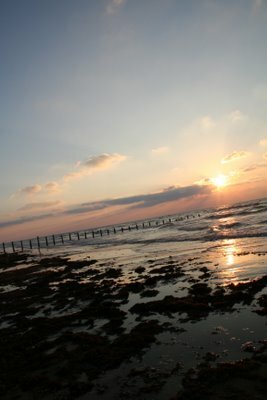 I'd never been to Corpus Christi before, or Padre Island National Seashore. Wow, I didn't realize we had oceans that appear green and deep blue and with beautiful vegetation-covered dunes along the Texas coast. A far cry from the ugly Galveston coast. Poor Savannah got the stomach flu for a day. Or food poisoning maybe, because no one else got sick. We all still had plenty of time in the ocean - the waves were amazing. It was the best boogie boarding/body surfing I have ever experienced! We rode the waves all the way into the shore at times!! It was so cool. I love the ocean. 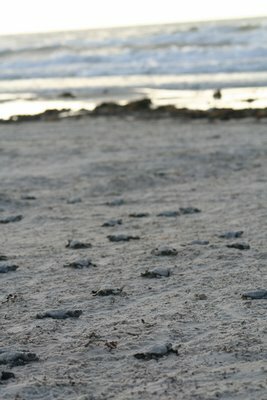 At the hatchling releases, it was really neat to see the little critters scurrying so very slowwwwwly to sea. They are so tiny. I've seen greens, loggerheads, leatherbacks in the wild and Kemp's (in captivity) but never Kemp's in the wild. 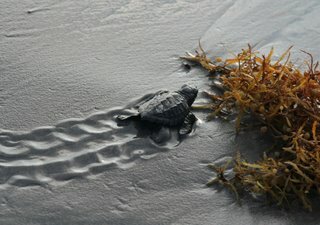 One a single day I was there, I saw a hatchling release in the wee morning hours, a dead loggerhead adult that had washed ashore, and 5 Kemp's nested but they were so far down the beach (it is 60 miles long) we only made it in time to get the eggs, which are transported back to the lab for incubation. We also walked down to the jetty, and there we saw several juvenile green turtles. A couple of teenage boys were fishing and they caught a spotted eagle ray. I was hoping they'd let it go - as they pulled it up it was just a stunningly beautiful animal. It was dark gray/black with white spots. It was hissing away, really angry (not surprisingly). They cut off its tail end to prevent it from stinging anyone with its barb. I hope they ate it and didn't just catch it for sport sake and kill it for no reason. Savannah cringed and it really affected her. It was good in the sense that she is even more appreciating the beauty of wild creatures and the sadness associated with needless killing. I am not a vegetarian nor opposed to hunting or fishing, but I do think we need to be cautious about which species we kill to eat, and some creatures should just be left alone. She has been reading books like HOOT and Flush by Carl Hiaasen and she said they really made her more environmentally conscious than she was before. This is great. 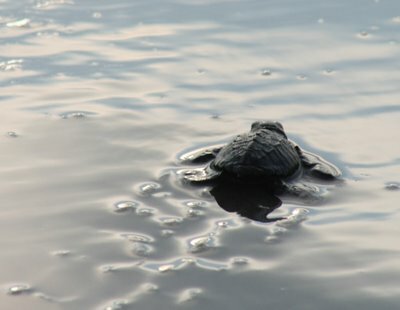 A Kemp's ridley hatchling heads to sea. 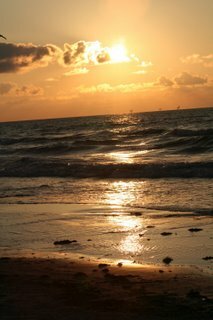 Sunrise at Padre Island National Seashore. 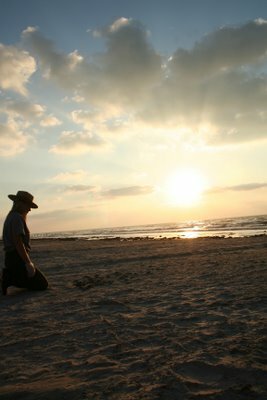 Dr. Donna Shaver, head of the sea turtle program at Padre Island National Seashore. The hatchlings are amazingly camoflaged as they walk down the beach. 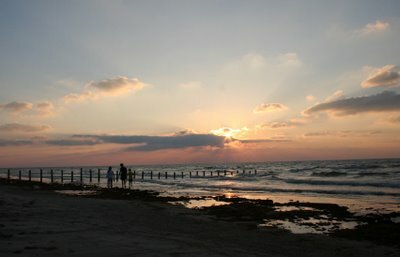 I'm off to go to Padre Island National Seashore which is on North Padre Island to report on Kemp's ridley sea turtles. North Padre Island is the longest remaining stretch of undeveloped barrier island in the world, and it's (amazingly enough) along the Texas coast. Kemp's are a fascinating sea turtle as they are the most critically endangered of the 7 sea turtle species but have started to recover due to a program in the 1990s. They nest in arribadas where thousands of them used to come ashore all in the same night. I saw an old movie of it and they would just climb all over one another in huge heaps and turtle eggs were getting dug up from other nests and it was craziness. Well now there aren't that many but they still come ashore around the same time. So there's no telling if I'll see one, but I should see the hatchlings. I've never been to North Padre Island -though I have been to South Padre Island, many times, which is where all the college kids go to party. This is 150 miles north of that, sort of near Corpus Christi. I am looking forward to it. I love the ocean and the beach. It is like home. My dad sent this to me, and i love it. i'm posting it here. I am enthralled. Here's a concept. Find a remote uninhabited island. Invite 5000 people from around the world to build an ecotopian paradise. Only 100 people can visit the island at any one time, in a sort of time-share model, but everyone who buys in can vote on how the island develops. The price is right: only $220 covers 7 days of meals and accomodations, just not airfare (and $440 for 14 days, $660 for 21 days over 3 years - you can break it up). The entire community must be built with the environment in mind - a carbon neutral paradise, where the funds help the local Fijians and harvest fruit and fish in a sustainable manner. When you visit, you can help build the accomodations and plan the community or you can just lounge soak up the tropical rays on the beach or snorkel offshore. And it will be on reality-TV for 3 years. Not an intrusive in-your-face broadcasting, and no one gets voted off the island. But TV cameras will record what the genius young people behind the venture call a global social experiment. I really like this quote. Not only does it hold true for collecting seashells, it's true of friends, and activities and possessions. Being selective in our choice of who we spend our time with, or what activities we do makes them all the more precious. How many kids have a closet full of toys they played with once? When I lived with my dad, I didn't have many toys. Yet I entertained myself with books, with tree knots (which my brother and I called wacko whammos) and my big yellow Tonka truck. I don't remember feeling deprived.